In a series of articles on “The Serious Artist” published by Dora Marsden in the British little magazine The New Freewoman (1913), Ezra Pound asserted that the “arts, literature, poesy, are a science, just as chemistry is a science,” and, further, that the arts provide most of the “unassailable data regarding the nature of man.” For Pound, the unassailability of art-data derives from their immediacy to the artist. As he explains in a later installment: “The poetic fact pre-exists.” In this formulation, however, a discrepancy emerges between the art-data captured in writing and the art-fact that precedes it, as when Pound praises his contemporary Allen Upward because “in all his interpretation of documents he has never for an instant forgotten that documents are but the shadow of the fact.” The shadow in Pound’s metaphor is cast not by the physical document, but by the figure of the author sitting before it. The documentary level of literature is thus relegated to being both after-the-fact of the poetic act and displaced as an abstraction of the real subject of literary study provided by the mind of the poet at work. Today, even as access to digital reproductions (transcriptions, images, recordings) and datasets (text files, TEI files, and various forms of metadata) makes it possible to forge new connections among agents, works, genres, and media, the figure of the individual author continues to delimit the way that modernist literature is edited, reproduced, and studied. This position paper advocates for the reconstruction and reimagination of non- and para-authorial perspectives on modernist literature through the study of the work of modernism’s literary editors. I reexamine work authored by Pound through the lens of its periodical editors in order to bring such mediated agencies out of the shadows of author-centered modes of interpretation and editing. The aim is to deauthorize the data models used to transform artifacts into art-data for digital editing and text analysis, while suggesting how models for unauthorized interpretation might be embodied in the kinds of new editions and aggregations taking place across the multiple sites discussed below. My intention, however, is not merely to draw readers from the regime of the figure of the author into a new realm, that of the editor, nor to give practical tips about how to use specific sites and resources, but to prompt modernist scholars to think across multiple projects and approaches to literary texts and data through a modernist-inflected notion of non- and para-authorial forms of composition and aggregation, namely those that we can see traced in the multichannel exchanges between author-editors such as Pound, Dora Marsden, Marianne Moore, and Virginia Woolf, as well as the digital re-aggregations being made possible by newly available public datasets, APIs, and databases. Amanda Gailey observes that “through the theory wars and into the digital age, editions organized around authorial genius more or less remain the gold standard,” resulting in “a state of digital literary editing that does not radically depart from the picture of scholarly editing several decades ago.” Indeed, over a hundred years ago Pound described the data that the arts provide in a manner amenable to author-centered, intentionalist theories of scholarly editing, which treat documents as witnesses to a work located not in any given artifact but in the authorial process they imperfectly reflect. The available witness documents of a given literary work are treated as reflections, more or less immediate, more or less accurate, of given moments of the author’s transferring of mental “poetic fact” into documented writing, with the interpretive value of the outcome measured by the edition’s claim to the authentic representation of its presiding genius. This almost exclusive emphasis on questions of authority has tended to sideline other types of critical considerations as external impingements upon editorial judgments. Modernist digital editors might do well to supplant the datum of the figure of the author with a more reflexive, plural subject through an unauthorized inquiry into the work of historical editors. Editorial questions—including which kinds of non-authorial traces will be reproduced, emended, or rejected, or what kinds of textual and contextual information will be prioritized in markup and annotation—need to be answered by assertions of what a given edition is intended to do and not merely what it reflects about its author(s). In assembling editions and research collections for present-day modernist studies, we should not undersell the importance of the historical editing that has preselected, presorted, and preordered the input for our editorial and analytical processes, nor overlook the potential of digital tools to excavate editorial information from text, markup, and images. Modernism’s literary data look very different when approached as reflections of the editorial work that conveyed them into public life. 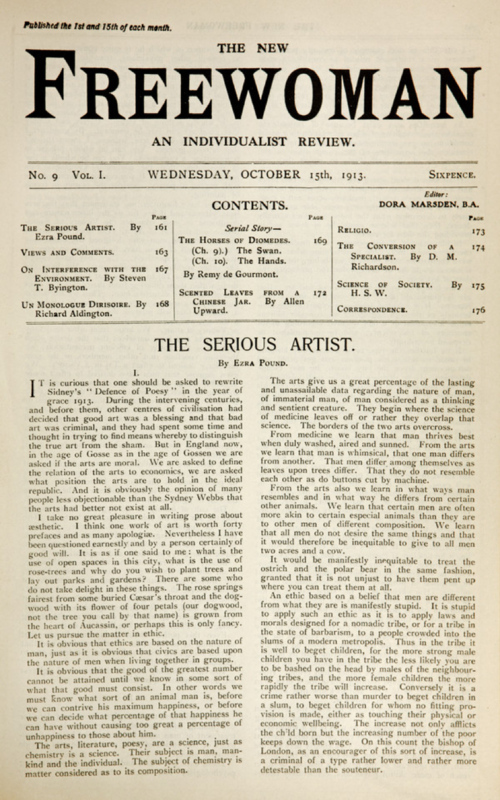 Marsden placed the first installment of Pound's “Serious Artist” on the front page of the October 15, 1913 number of The New Freewoman. Fig. 1. Front page of The New Freewoman, October 15, 1913. By ceding the lead item to Pound’s efforts, Marsden cannily promotes a new contributor to her magazine and his artistic connections while also granting his argument a formal precedence in the ordering of the magazine’s contents. This order, in turn, allows her to respond to the article dialectically in her immediately following “Views and Comments” editorial, where she parses and re-aggregates Pound's argument by explaining “that the entire commerce of any journal is wholly in terms.” Over Pound’s diagnosis of art’s modern condition as a specialized science, Marsden adds a layer of ideological critique that questions the primacy of the artist’s perspective: “The difference between science and art is not a difference of method, but of subject matter. Art is the scientific spirit applied to soul, observing, collating, noting” (Marsden, “Views,” 166). By restating Pound’s terms from a point of view external to “the arts,” Marsden reduces the forms of knowledge Pound describes as “unassailable data” to a priori concepts to be processed by her own more fully developed scientistic philosophy. The poet is to some extent made into a specimen for the observation of the philosopher. Fig. 2. Front page of The New Freewoman, November 1, 1913. 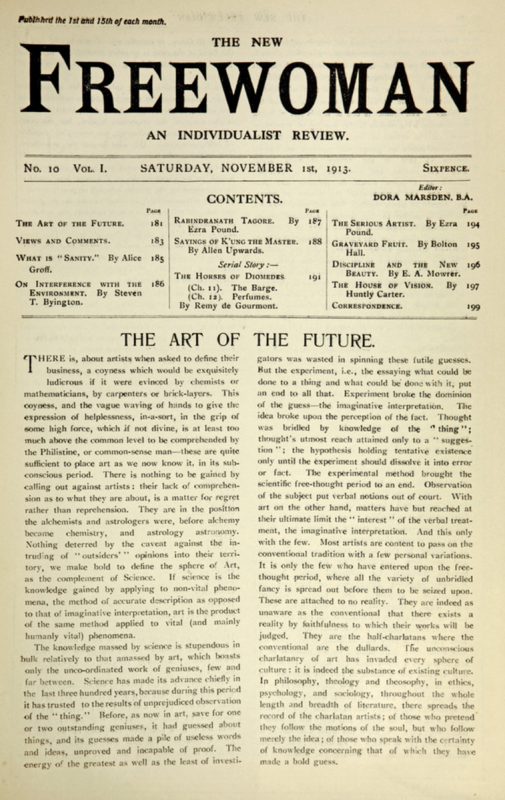 Marsden extends her argument in a leader to the next number of The New Freewoman titled “The Art of the Future,” this time preempting the next installment of “The Serious Artist” by relocating it toward the back of the issue: “There is, about artists when asked to define their business, a coyness which would be exquisitely ludicrous if it were evinced by chemists or mathematicians, by carpenters or brick-layers [. . . and is] quite sufficient to place art as we now know it, in its subconscious period.” The “subconscious” data provided by the arts are to be analyzed and interpreted by induction into the broader, more self-consciously dialectic forms of Marsden’s magazine. This induction is a business both of terms (the isolation and redirection of the artist’s verbal data) and of editorial forms (the design, selection, and arrangement of contributions within the patterns of a serial publication). As the author of “The Serious Artist” Pound asserts the ethical and social prerogatives of the arts among the sciences by the rhetorical deployment of unassailable data. Marsden’s editorial perspective, however, suggests the multiplicity of vantage points from which the literary data of the author’s published text can be explored and reaggregated. The distinctions between authorial and editorial perspectives seen in this example apply whether they are characterized by collaboration, coincidence, or even conflict. The New Freewoman’s participatory, dialogic forms make its editorials, contributed essays, letters to the editor, placed ads, and other miscellaneous textual components “bristl[e] with interrogations,” as Marsden put it in an ad to her precursor magazine, The Freewoman. This “bristling” format would seem to achieve a rearrangement of the field of literary production: a dual enterprise of actively engaged readers and of responsive writers meeting together. However, Marsden’s editorial work does not so much disagree with Pound’s prose as transform it. The move from authorial to editorial perspectives involves more than changes of mind; it entails changes in the mode of literary interpretation and a reimagining of the work of literature. characterized by the pitiless divorce which the literary institution maintains between the producer of the text and its user, between its owner and its customer, between its author and its reader. This reader is thereby plunged into a kind of idleness—he is intransitive; he is, in short, serious: . . . he is left with no more than the poor freedom either to accept or reject the text: reading is nothing more than a referendum. Alternatively, The New Freewoman, which contains “The Serious Artist,” makes clear that its reader has many other levers on its discourse than assent or dissent with the perspective of a single author. The periodical, as writerly text, presents a congeries of perspectives while refusing to take the figure of the individual author too seriously. Barthes’s “ideal text” is intended as an abstraction, but it need hardly be so abstracted from the pages, books, issues, and volumes on which the scenes of literary work are registered. A literary text can mobilize codes beyond the semiotic and linguistic ones Barthes casts as the ultimate horizons of a plural text’s systems of meaning. By recapturing the mobile, distributed perspectives of modernist editors, it becomes possible to see how even so-called “high modernist” works such as Pound’s are constituted plurally by multiple agents and agencies irreducible to any isolated authority. The multiplex lens of the editor allows what would otherwise be treated as a single line of communication to be parsed into multiple sub-communications of greater complexity, capacity, and variety. As recent and ongoing digital scholarship and editing continue to transform modernist documents into data for fresh mobilizations and aggregations, several developments are especially promising for the integration of editorial perspectives into modernist textual and editorial theory, even for those without institutional support to create freestanding digital editions or sites of their own. 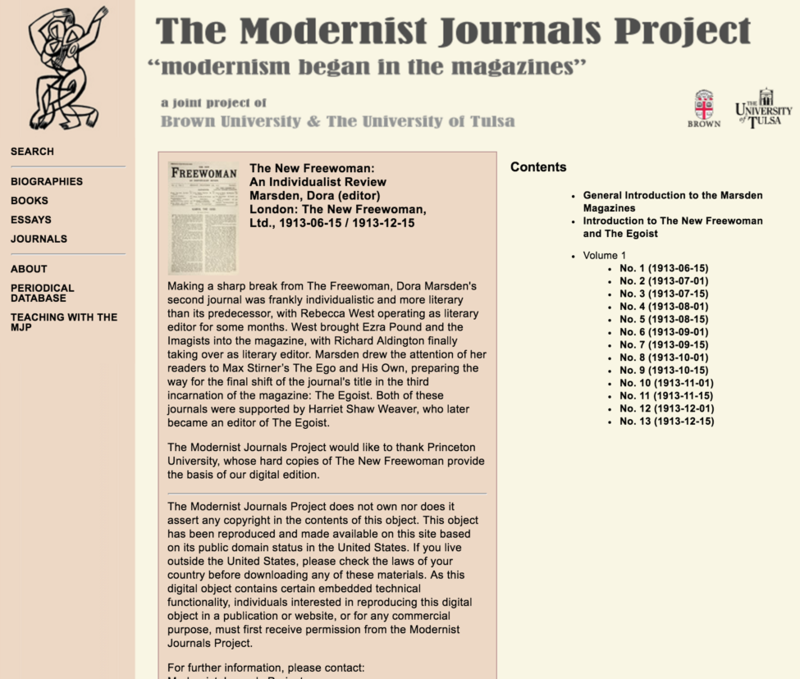 For example, the products of over twenty years of the Modernist Journals Project’s (MJP) digital editing of modernist little magazines have been added to the Brown University Digital Repository, opening this data for queries via an Application Programming Interface (API). API queries can be combined to generate alternative views of the MJP’s data, including ones organized by editor instead of author, sorted by further metadata fields, such as date, location, or associated contributors, to reveal a host of vantage points on editorial interactions and influences. Fig. 3. 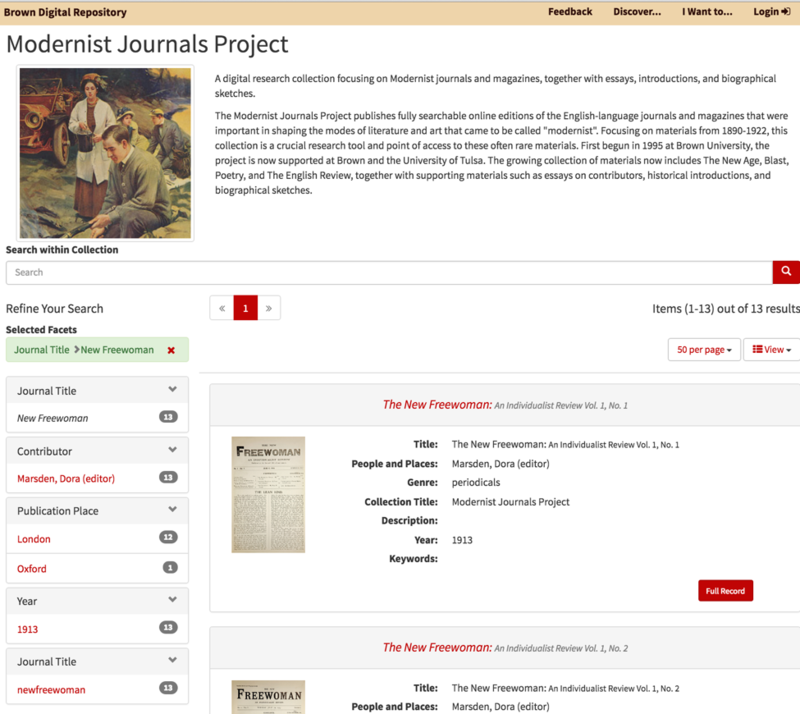 Screenshot of The New Freewoman on the Modernist Journals Project. Fig. 4. Screenshot of faceted search results for the Modernist Journals Project in the Brown Digital Repository. Fig. 5. 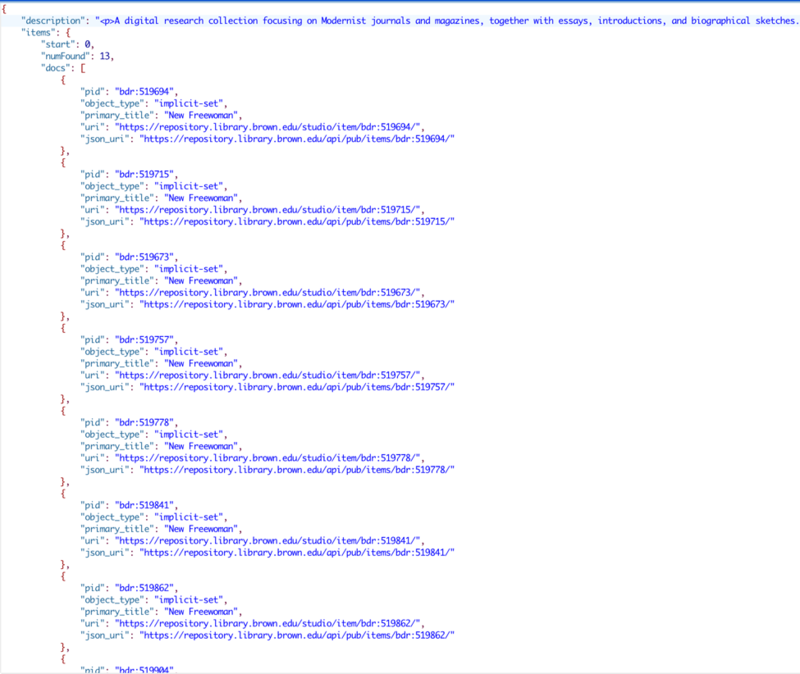 Snippet of JSON metadata from the Modernist Journals Project accessed through the Brown Digital Repository API. The field for such research into avant-garde periodicals, including publications in languages other than English, is also being expanded by the Blue Mountain Springs API developed by Clifford Wulfman and the Center for Digital Humanities at Princeton. Large cultural repositories that include significant modernist collections—such as the Digital Public Library of America and the New York Public Library—are also accessible through APIs, offering a huge amount of material to be digitally reexamined and rearrayed along new theoretical axes. Visual information in facsimiles and image repositories offers another mode of access to the “triumphant plural” of the editorial work. Select titles within the Blue Mountain Project have been encoded to map transcriptions and metadata to specific regions of facsimile images—using standards from the International Image Interoperability Framework (IIIF) and the Text Encoding Initiative (TEI)—enabling queries to reach within the mixed visual spaces of a magazine facsimile and return the location of specific items within its pages, as in Figure 6 where this encoding allows for locating and highlighting a text contribution within the complicated, irregular page layout of an issue of Dada. Fig. 6. 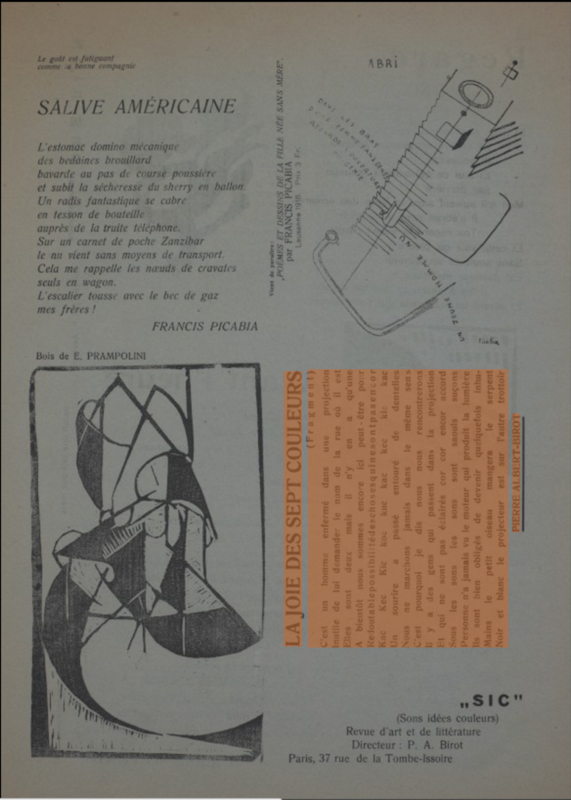 Illustration showing Dada’s irregular page layout as displayed on the Blue Mountain Project. Emerging methods for image analysis of digitized modernist collections, using tools such as Optical Character Recognition (OCR), the Software Studies Initiative’s ImagePlot (a macro for the general purpose ImageJ program), OpenCV, the Processing language, and MATLAB, promise to extend the field of research into the work of editing by greatly increasing the scope and depth at which visual features and patterns, such as illustrations, design details, layout styles, and the relationships among them—all difficult or even impossible to capture in manual markup—can be addressed. Avant-text materials, manuscripts, and typescripts also bear richly visual editorial traces. Manuscript digital editing should not merely recapitulate author-centered data models, even when conducted within the environment of a single author’s archive. The Marianne Moore Digital Archive (MMDA) is editing the 122 working notebooks Moore kept during her long career, seeking to make available through dual facsimile and diplomatic editions, linked visually line-by-line, what Cristanne Miller has described as the “deep cultural genesis” of Moore’s poems. The MMDA plans to connect its editions to a wealth of related literary and historical resources to facilitate alternative forms of reading and navigation beyond the tracing of the development of the author and her work in isolation. In partnership with the University at Buffalo’s Center for Unified Biometrics and Sensors, the MMDA is also developing an integrated platform for digital manuscript editing adapted to the particular issues posed by early twentieth-century documents and to the fields in which they are taught and researched. On a related front, The Modernist Archives Publishing Project, as discussed by Battershill et. al, is charting the proliferation of modernist publishing ventures with the goal of moving research “beyond isolated studies of individual houses to examine translateral networks of authors, artists, editors, press workers, and texts across different publishing venues.” Millar-Usiskin, Walde, and Winter’s approach to the Linked Modernisms ontology further promises to deliver “new models of discoverability and navigation” by harnessing the potential of the semantic web to invite us to look at modernism through a “dynamic and shifting center” of relations between agents and cultural productions. There is not space here for a full cataloging of the digital sites, both longstanding and emerging, currently performing the work of unauthorizing the data and models of literary modernism. As both a response to the breadth of modernist digital scholarship and an effort to facilitate its continued growth, Modernist Networks (ModNets), for which I have served as Project Manager since 2015, operates as a historical node in the Advanced Research Consortium (ARC),which includes NINES, 18th-Connect, and MESA). ModNets aggregates the metadata for digital resources from a range of sites that have been recognized through technical and content-area peer review, allowing for advanced text and metadata queries across multiple sites using a central database. 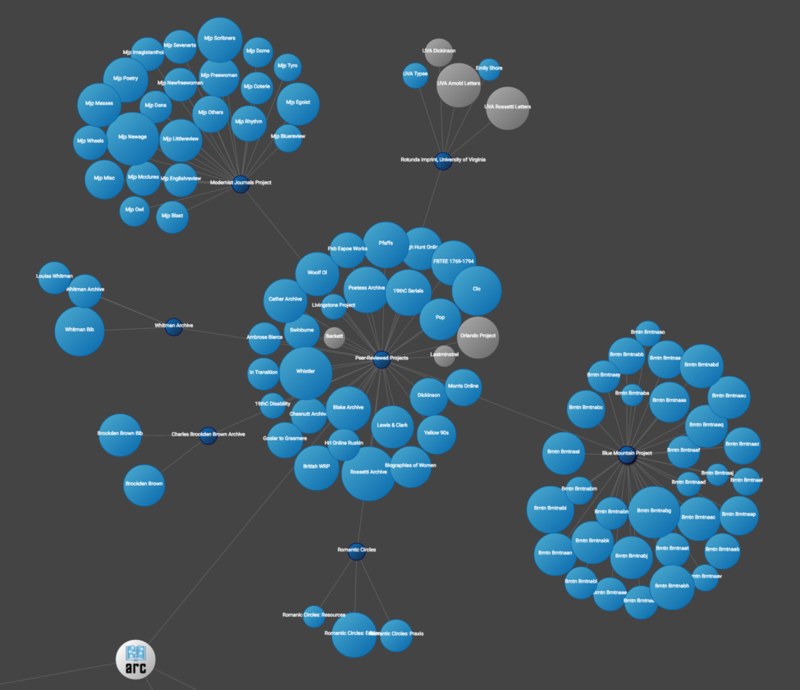 Metadata from ModNets’s federated sites are also included in the network analyses and visualizations being conducted on an ARC-wide scale, such as the Big Data Infrastructure Visualization Application (BigDIVA) interface, which provides dynamic views of search results across the disciplines, fields, and various subcategories represented in ARC. Fig. 7. ModNets' aggregated digital resources as seen on the ARC Consortium’s BigDiva. ModNets’s federated structure emphasizes a multiplicity of perspectives over any singular form of authority by making the products of digital scholarship more widely discoverable and available for aggregations outside the bounds of individual sites, including those dedicated to the works of a single author. Users are encouraged to collect objects from existing editions and collections to form customized research collections or aggregations according to a range of criteria and to undertake their own editorial experiments in the ordering, selection, and arrangement of our rapidly expanding digital archive(s) of modernist literature and culture. In his study of the overlapping authorial and editorial activities of Edgar Allan Poe, that important precursor to many modernists, Jerome McGann calls for an editorial environment “that does not make Poe the pivot point of everything, the ‘center’ determining what we see and how we see it, but only one possible center and ‘perspective.’” We must not, as T. S. Eliot wrote in 1923, between the publication of his and Pound’s two greatest poetic collaborations, The Waste Land and A Draft of XVI Cantos, distinguish “too bluntly” between “critical” and “creative” activities: “Probably, indeed, the larger part of the labour of an author in composing his work is critical labour; the labour of sifting, combining, constructing, expunging, correcting, testing.” This “critical labour,” akin to Barthes’s notion of “literature as work,” and which I have described as editorial work, does not end with the author’s perspective, either. In other words, what stands in the way of realizing an unauthorized edition and the transforming of modernism’s unassailable art-data is really only a very distorted view of what an author is and does, a distortion perhaps naturalized only by habituation. The subject of any edition of Ezra Pound will not be the author, but what we might call the “author-editor” of his works, a set of Ezra Pounds working at different times and in different modes and social situations both upon his own works and upon the works of others and, in turn, seeing his works worked upon by others. In this way, historical editing would no longer seem like noise to be eradicated from the editorial signals we wish to send to the future, but an opportunity for interpretation and a responsible subject for critical reproduction. Ezra Pound, “The Serious Artist I–II,” The New Freewoman, October 15, 1913, 161. Accessed through the Modernist Journals Project, modjourn.org. Ezra Pound, “The Serious Artist III,” The New Freewoman, November 1, 1913, 195. Ezra Pound, “The Divine Mystery,” The New Freewoman, November 15, 1913, 207. My focus on the editorial acts of selection, arrangement, and the use of paratexts, such as editorial commentary, is intended to help distinguish these from editing in the narrower sense of authorial revision, as explored, for example, in Hannah Sullivan, The Work of Revision (Cambridge, MA: Harvard University Press, 2013). On the sociological dimensions of literary editing only glanced at here, see, for example, Jason Harding, The Criterion: Cultural Politics and Periodical Networks in Inter-War Britain (Oxford: Oxford University Press, 2002) and Dean Irvine, Editing Modernity: Women and Little-Magazine Cultures in Canada, 1916–1956 (Toronto: University of Toronto Press, 2008). Amanda Gailey, Proofs of Genius: Collected Editions from the American Revolution to the Digital Age (Ann Arbor: University of Michigan Press, 2015), n.p..
 See also Jerome McGann, A New Republic of Letters: Memory and Scholarship in the Age of Digital Reproduction (Cambridge, MA: Harvard University Press, 2014): “[S]cholarship and interpretation . . . are too narrowly conceived when they are imagined as being about something . . . Rather, scholarship and interpretation are procedures that do something about something” (79, emphasis in original). Dora Marsden, “Views and Comments,” The New Freewoman, October 15, 1913, 165. Dora Marsden, “The Art of the Future,” The New Freewoman, November 1, 1913, 181. My point is not to salvage Pound’s prescriptions through recourse to the philosophy of his editor in Marsden—Linda A. Kinnahan’s examination of the lines of masculinist, egoist thinking that characterize Marsden’s philosophy as much as Pound’s warn against any such appeal; see Poetics of the Feminine: Authority and Literary Tradition in William Carlos Williams, Mina Loy, Denise Levertov, and Kathleen Fraser (Cambridge: Cambridge University Press, 2008), 22–27. Advertisement for The Freewoman, The New Age, November 23, 1911, 95. Roland Barthes, S/Z: An Essay, trans. Richard Miller (New York: Farrar, Straus and Giroux, 1974), 4. Emphasis in original. I refer here to the modes presented by these examples and not the precepts Marsden and Pound might or might not have shared, nor to Pound’s complicated relationship in the totality of his writing to writerly and readerly views of the text. Brown Digital Repository API documentation. For a good introduction to APIs in general, see the extensive, user-friendly instructions assembled for the Digital Public Library of America’s API. New York Public Library Digital Collections API documentation. The Pulp Magazines Project has added enhanced metadata, opening editorial perspectives into broader cultural terrains, as well. Several participants of The Blue Mountain Project/Modernist Journals Project Hackathon, hosted by the Center for the Digital Humanities, Princeton University, February 5–6, 2016, presented on ImagePlot and MATLAB for analyzing collections of periodical images. Special thanks to Devon Elliot, whose presentation “Algorithmic Eyes: Seeing Sources through Computer Vision” at the Hard-Coded Humanities Conference, University of Rochester, April 15–16, 2016, demonstrated the combination of several of these tools to analyze digitized periodicals. Cristanne Miller, Nikolaus Wasmoen, et. al, “About the Archive,” Marianne Moore Digital Archive. Quoted in Faye Hammill and Mark Hussey, Modernism’s Print Cultures (New York: Bloomsbury Academic, 2016), 103. Jerome McGann, A New Republic of Letters: Memory and Scholarship in the Age of Digital Reproduction (Cambridge, MA: Harvard University Press, 2014), 159; written with regard to “The Little Longfellow War,” a controversy kicked off in The Evening Mirror by Poe’s criticism of Longfellow and continued by Poe himself, attacking his own article under a pseudonym in The Broadway Journal, a publication he would later serve as editor. T. S. Eliot, “The Function of Criticism,” The Criterion 2, no. 5 (1923): 38. This is not to say that a single-author edition cannot address multiple perspectives on its subject. The William Blake Archive for example, has long sought to present Blake in his multiple guises as artist, poet, and professional engraver.